DOG OWNERS ARE being warned to control their pets after a spate of recent attacks on sheep in Co Wexford. The warnings were issued by the Irish Farmers Association (IFA) after four sheep died and a further six were injured in two separate incidents in the past week. Seven sheep were injured in an attack on a farm in Bridgetown last Friday. Two of the animals were so badly hurt that they had to be put down. On Sunday another two sheep were killed and one was injured on a farm in Murrintown. The Chairman of Wexford IFA, James Kehoe, explained that there’s also been other incidents in the past month where sheep have been attacked. In some of the cases it’s still not known which dog perpetrated the attack and there are fears amongst sheep farmers that attacks will happen again. “Speaking to the farmer in Bridgetown, the sheep were very badly injured and there was nothing for it other than they be humanely put down,” he said. “These incidents are very emotional and worrying for a farmer. “You’re afraid next time that you go and check on your sheep, you’re afraid what might be facing you. Farmers call me after attacks and some of them would be in an awful way. You have incidents where it’s like a war zone. Sheep can be killed, missing, panicked and stuck in a ditch or even drowned in a bit of water. Your heart would go out to the farmers. “It’s impossible to defend against because it can happen at any time of day or night,” he added. The IFA said in a statement to TheJournal.ie that its statistics indicate that there are between 300 and 400 attacks by dogs on sheep each year. An average of 11 sheep are killed or injured per attack resulting in up to 4,000 sheep falling victim to dog attack each year. 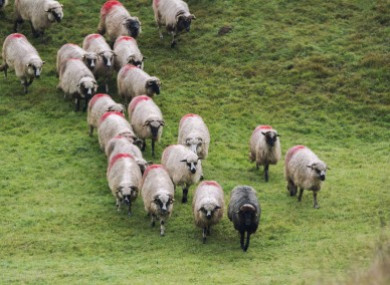 The sheep chairman of the IFA, John Lynskey, said marauding dogs can inflict horrendous damage on a flock and issued a warning to all dog owners that they are responsible for keeping their pets under control at all times. Farmers have a right to protect their sheep flock and can shoot a dog worrying, or about to worry their flock. “Unfortunately, I am taking calls on a frequent basis from sheep farmers around the country who have suffered attacks,” he continued. There are far too many dog owners not taking the responsibility that goes with owning a pet. Dog owners have an obligation to have their dog under control at all times. Lynskey also reminded dog owners that they have an obligation to keep their pets under control at all times and can be held responsible for losses involved in dog attacks, with potentially serious financial and legal consequences. Email “‘It’s like a war zone’: Warnings issued to dog owners after spate of attacks on sheep in Wexford”. Feedback on “‘It’s like a war zone’: Warnings issued to dog owners after spate of attacks on sheep in Wexford”.